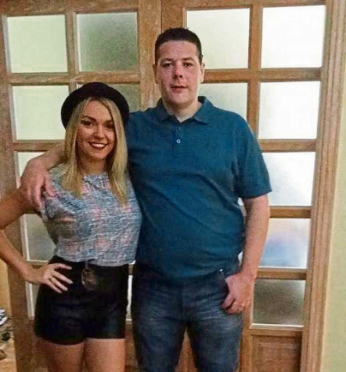 Samantha Steven, 24, lost her brother Barry McGill, 40, in late June after he suffered years of depression. His psychological condition was so bad that Miss Steven sometimes accompanied him to appointments at New Craigs Psychiatric Hospital in Inverness. He was also given the phone number of a psychiatrist working there to call when he was feeling at his worst. Mr McGill’s death came as a big shock to his family because he usually talked so openly about the way he felt. Miss Steven said: “It was huge shock, because for years and years whenever he was feeling rubbish he would be over with me and Mam and talking about how he was feeling. Miss Stevens decided to take action to do what she could to help others who have struggled psychologically since her brother’s sudden death. She is now preparing for a 40-mile sponsored trek from Glendoe to Inverness to raise money for the Inverness-based charity Mikeysline. And she has almost reached her £1,000 target, only a few days after the fundraiser was launched. Mikeysline was founded three years ago following a number of suicides in the Highlands and has a text line as well as a drop-in centre people can visit for support. Miss Stevens said she was determined to try to help raise awareness of mental health and the organisation. She hopes to encourage “positive and hopeful” conversations on the issue.